Are you considering investing in ERP software for the first time? Or maybe you already have an ERP solution but you’re worried it’s becoming dated. 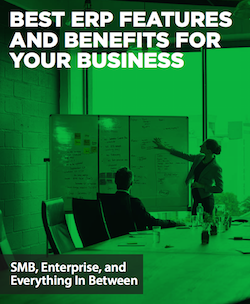 If either of the above apply to you, read our latest guide on the top ERP features and benefits based on the size of your business. You may be surprised at how versatile and cost-effective it is becoming - regardless of if you own a small business or run a large enterprise. To access the new 2018 guide, click here.